I’ve long advocated for social emotional learning (SEL) to be revered as critical to a child’s education and development. Over the last few years, I’ve rallied the growing momentum of support for social and emotional learning. And, just last week, I dove head-first into Wildflowers by Jonathan Raymond, President of the Stuart Foundation and former Superintendent of the Sacramento City Unified School District. 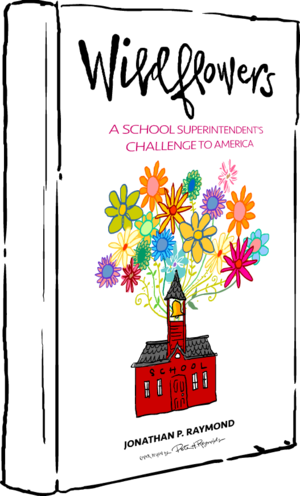 To say Wildflowers is a MUST-READ for all social emotional learning champions is an understatement – this book is mandatory for all who want all children to grow and bend – not break – in our education system. Raymond candidly describes the difficult task he faced as Superintendent and his drive to create real change by emphasizing the “whole child.” Test scores and graduation rates soared while children began to feel more joyful, appreciated and powerful inside their schools. Calling on his experiences, Raymond provides us with an action plan to use his students’ successes as a roadmap for our students’ achievements. One of my favorite stories from the book is about a boy named “Anton,” who challenged Raymond to get rid of styrofoam lunch trays because they are not good for the environment. He accepted this challenge and within 4 months removed the trays from schools. When speaking of Anton, Raymond says “Was Anton part of my ‘team?’ Yes, absolutely! When we say that educating the whole child means tending to the head, heart, and hands, we should add that whole child education is reciprocal, a meeting of the minds between adults and children in an atmosphere of mutual respect.” Anton’s voice was heard and as a result, a positive change occurred. This type of listening, support, and modeling are critical for social emotional learning to take place and whole child development to blossom. How refreshing to see a book focused on practical advice from a former Superintendent AND features SEL as a critical factor in creating meaningful change. Raymond’s honesty throughout the book helps readers understand it’s not easy but putting children first and challenging the education system to stay focused on the whole child can deliver real impact. Thank you, Jonathan, for helping people see what SEL in education looks like in action.